The Galway Tent Blog: Poolbeg Incinerator "Rogue Employer"
The USA's National Labor Relations Board this week issued a comprehensive complaint charging Covanta Energy Corp. and all of its U.S. subsidiaries with violating federal labor law. The board’s action confirms our first-hand experience that Covanta is a rogue employer with no respect for the rights of its employees. 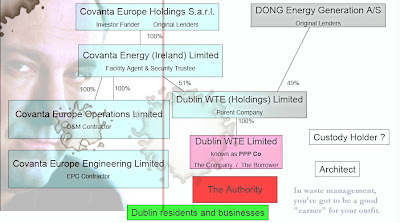 Dublin City Council has a secret deal with Covanta to run the proposed Poolbeg Waste-to-Toxins incinerator. Possibly to dodge US courts the deal is with an offshore Covanta outfit - a special purpose entity firewalled in secretive Luxembourg (guess why). The USA's National Labor Relations Board is an independent federal agency created by Congress in 1935 to administer the National Labor Relations Act, the primary law governing relations between unions and employers in the private sector.